Sometimes it's really hard to see the light at the end of the tunnel. Every phase of my life, it always comes back to me. Some would call that line vague and ambiguous. I would agree. Never stop believing in yourself. Never stop believing that things will get better. Never stop believing that you can conquer all obstacles. Never stop believing you'll find the light on the darkest of your days. I still love the grit that is GNR. I think this is the first album I bought that had the parental advisory regarding explicit lyrics. All because of the f-word. Thank you, Tipper Gore. I think this might be my favorite Manowar song. I often hear this one in my brain when I'm having a rough day because we must always carry on. When I was young, I knew I'd never bring children into this crazy world and thrust such madness upon them. Instead, I brought children into this world and feel that I've been successful in thrusting some love upon this crazy world. I'm proud of the wonderful, caring, beautiful young women I've raised. I'm proud of the strong, loving women they've become in the face of such an adverse world. If you've never been choked by the bony fingers of depression, you shouldn't judge those who struggle with it. We carry around pieces of our past. If we can't acknowledge them, accept them, embrace them, they haunt us forever. I am seen in many forms, I am a young maid, a loving but firm mother, an old hag, an Appalachian granny, a Hoodoo mama, a priestess of old Gods and Goddesses, a battlesister for the earth, a coiling Shakti snake. I am a Witch. My worship is communing with the Divine through Nature. I try to grow vegetables and herbs in the earth so that I might use the healing powers that exist within Nature to help myself and others. I am a Witch. I perform my rituals in Sacred places that I create or that already exist indoors and outdoors. The four Watchtowers with the Elemental Powers and their Guardians are forever with me to aid and guard me. I eternally stand in the Crossroads between the Cosmos above, the Planet below, and the Spiritual within. I am whole within the Universe. I am a Witch. I journey in meditations, rituals, and dreams. I use hallowed and consecrated tools to aid me on my magickal journeys. 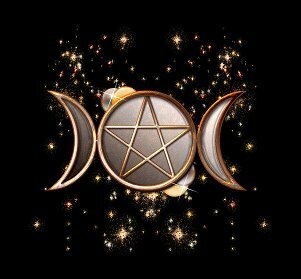 These include cauldrons, crystals, candles, incense, ritual oils, water, salt, soil, feathers, bells, brooms, rattles, drums, wands, staffs, blades, mirrors, Tarot cards, and Rune stones. My spirit travels throughout Time and Space; and I return from my journeys with insight, knowledge, and power. I go between the three worlds to heal, grow, and transform. Empathy, compassion, understanding, and mercy are natural, not supernatural, and they are a part of my daily life. I am a Witch. I follow the Seasons and the Elements and the Circle of Life. I endeavor to keep all parts of my Self healthy and balanced. I work to restore balance in my environment and in Nature. I hear the anguish of Mother Earth, saddened with the damage being done to Nature by human kind. I am alarmed by pollution and destruction of the Air, the Earth, and the Waters. I am dismayed by the Spiritual pollution of hatred, greed, bigotry, intolerance, racism, addiction, violence and despair. I work and conjure each and every day to restore balance, peace and harmony in the lives of others and the Planet. I try my best to live each day in harmony with others and with Nature. I was gonna do Gypsy Road today, but Pete posted it on my wall last night (great mind think alike, I tell ya!!). So I chose another Cinderella song for the day! We made it once she said "make me again"
I'm sure I'm not the only person whose first thought, upon hearing the name Queensryche, is Silent Lucidity. That happens to have debuted in Spring of 90, by the way. So I had to step back in an effort to maintain the integrity of the 80s theme. Okay, not really. There are several albums that came out in 1990 that truly qualify as a part of the 80s hair-band theme. But why not go for something that isn't the first one popping in your mind? Here's the thing about all this hair band music: today, we laugh, giggle and snicker at all that hair. But underneath it all, we're very serious about our love of the music. The talent of the musicians is awe-inspiring. One more thing: this song takes on a whole new meaning as the mother of two beautiful girls. It'd be a shame not to see you again"
I'll show you love like you've never seen"
Ain't seen nothin' like me"
And the 80's hair continues. This band has been rockin' since 1970! 43 years later, they're still rockin'!! Okay, so it's not REALLY 80's hair, exactly...the album was released in 90, but, but, but... that school year started in 89, right?! I love Tommy's shorts and boots in this!